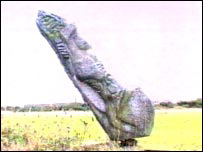 A German artist has created a series of sculptures from Cornish granite which are on display along the stretch of the A30 from Sennen to Land's End. Rory Tie'Tigo says his skills require strength and dedication. His latest project is turning an 85kg (187lb) lump of granite into a surfer sculpture. It takes about 90 hours chiselling away to make the rough cut rock into a smooth sculpture. Rory has spent the past four years working on the Cornish Uprights. He says they have been inspired by Cornish gateposts.